Art of Play is the online home of Dan and Dave Buck, twins who first made a name for themselves as magicians. They subsequently branched out into the world of cardistry (i.e. card flourishing), and are widely regarded as one of the top pioneers and innovators in this relatively new art-form. They've played a major role in the growth and development of this young discipline, which is increasing in popularity worldwide at an incredible rate. 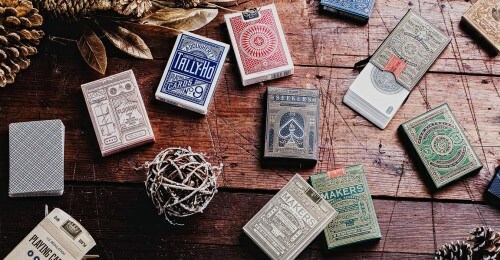 Their expertise with and interest in the world of playing cards also led to the establishment of Art of Play as their own brand and online retail outlet. Since 2013 they have been selling a range that includes hundreds of different decks of quality playing cards, as well as unique games and puzzles. 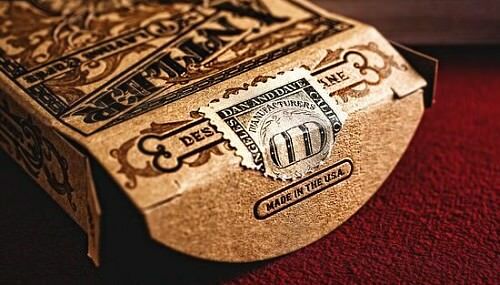 And besides carrying a large inventory of luxury playing cards, Dan and Dave have also been contributing to the custom playing card industry by producing decks of their own, under the Art of Play label. 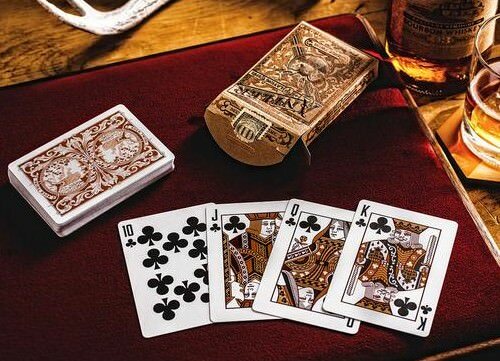 Over the last couple of years alone, they have been producing well over a dozen different decks of custom playing cards every year, with many wonderful and popular designs. I've covered some of their amazing decks previously, and in this article I'd like to focus on some of their newest releases which have just hit the market in the last six months or so. If you're looking for a quality deck of playing cards, or something classy and sophisticated for your poker night, look no further. 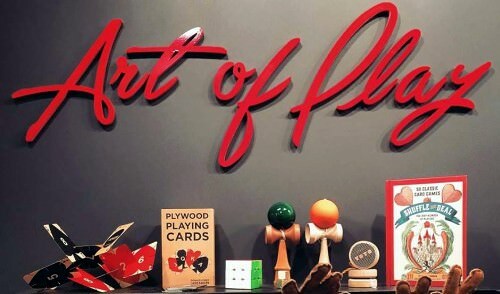 Art of Play has you covered, and decks like the ones featured in this review will give you a good idea of their tremendous range and high quality. Not every deck of playing cards is a one-size-fits-all, suiting every purpose. 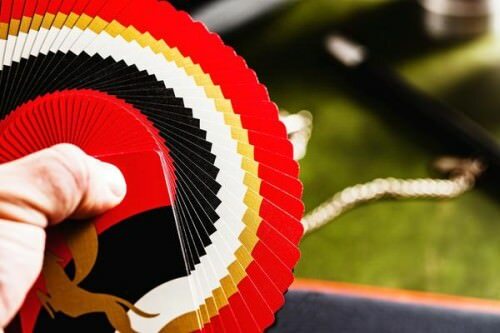 Some are so customized, that while they are adorable for collectors or cardistry, they aren't very practical for playing card games or for performing card magic. But on the other hand if you are looking for something sophisticated and elegant that is also very functional, with clearly recognizable indices and suits, the decks in this category are for you. These decks are practical, while at the same time making a stylish statement. The green and gold MAKERS Playing Cards deck (a previous release) is one of the classiest and elegant decks that Art of Play has ever produced. And now there is a second edition, which is arguably even better than the first. 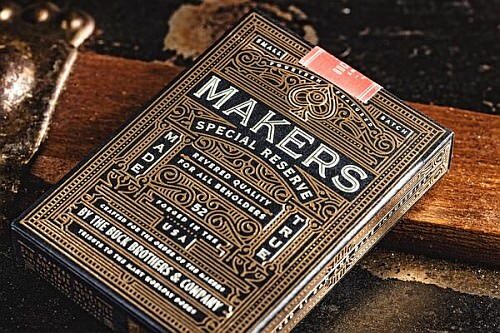 Introducing: the MAKERS: Blacksmith Edition deck. 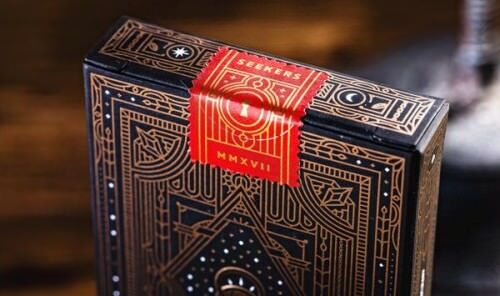 The tuck box of this deck is truly amazing, with elegant gold foil stamped all over the black box in intricate lines that create a look of sheer beauty and class, both inside and out. 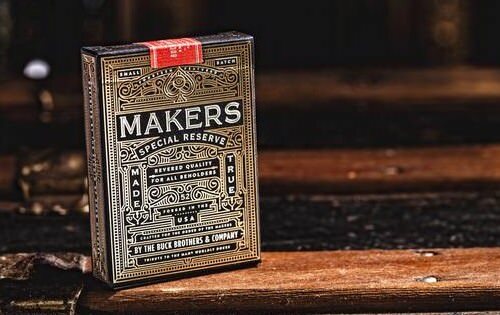 Silver foil is also used, allowing special words and phrases to pop out such as the name "MAKERS Special Reserve", "revered quality for all beholders" and "made true"; all of which confirm how special this deck really is! Even the larger-than-standard stamp that is used to seal the tuck, with its handwritten font, makes it look super classy. While the outside of the tuck case is already amazing, the inside of it is magnificent! Gold foil is stamped throughout the inside of the tuck in the same elegant swirls and lines as on the outside, and combines together to create an absolutely exquisite tuck case. This deck has been designed by Chad Michael, who has done an excellent job all round. The back design is the same as the first edition, just using a black background rather than the original green. The jet black background looks amazing as the canvas on which the gold ink can clearly stand out, creating a look of pure beauty. Intricate lines are featured on the entire card back, and the closer you look at the cards the more details you notice and appreciate. The attention to detail continues with the Ace of Spades, which is an oversized piece of delicate artwork, featuring a head forming a spade, and has significant aesthetic appeal. 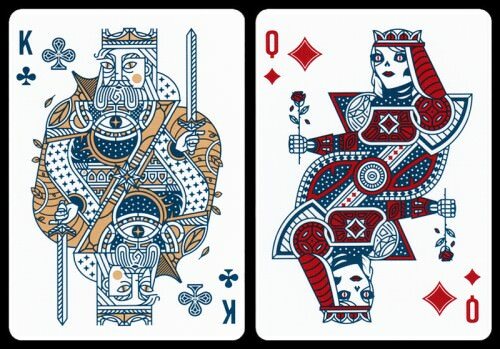 The faces of the cards also have intricate lines forming the pips and the court cards, making it a truly ornately decorated deck in every respect. The pips themselves are all thoroughly customised, and are also comprised of intricate lines, which looks very effective. The court cards all represent different foundational "makers" that civilisation has been built on, such as the Smith, the Monarch, or the General. 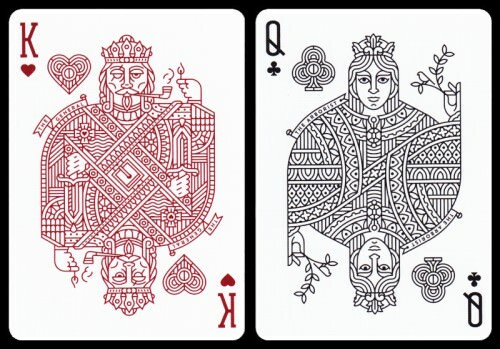 Like the rest of the deck, each court card is composed of lines with a high level of detail, in either red or black depending on the suit, which ensures a good and clear unity between the suits. 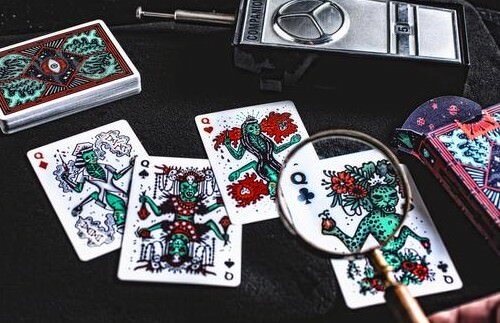 The deck comes with two matching Jokers, which both depict the Marauder, along with a quote that "death makes all things equal". Also included in the deck are two ad cards, one for Art of Play and the other for Dan and Dave. The cards are printed by USPCC on a special crushed stock, and they handle exceptionally well, being super soft and having a great finish that allows for good fanning and spreads. This quality deck is great for card games, card magic, and even cardistry due to its great stock and design. There’s something special about the outdoors, the deep forests, the flowing rivers and the rolling hills, and the Antler: Tobacco Brown deck helps captures something of this amazing beauty and wonder. 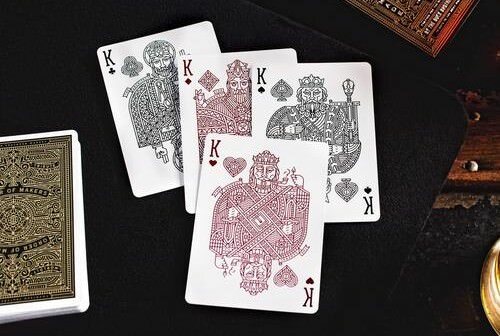 Art of Play has previously printed two editions of the Antler Playing Cards, the Standard Edition and the Limited Edition, both editions having two decks, featuring the colours of Hunter Green and Deep Maroon. Now there is another deck to add to the stable, featuring a Tobacco Brown colour scheme. 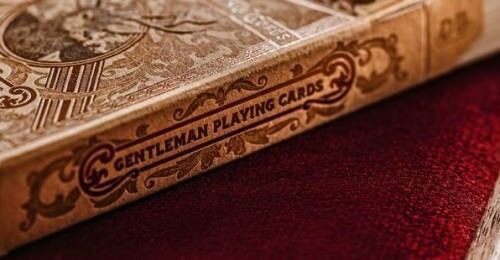 These playing cards are housed inside a beautifully crafted tuck box made of premium brown paper. The letterpress on the tuck box, along with exquisite embossing and foil, creates an elegant and amazing looking tuck case. A brown/gold foil is used which looks wonderful against the backdrop of brown cardboard. 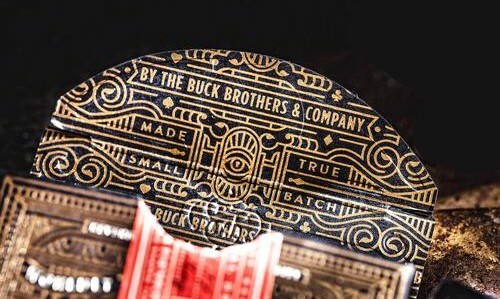 The front of tuck box pictures a buck’s head which has been embossed for added impact, so it really pops out of the box. Meanwhile the back of the tuck shows the card-back design, while the seal is appropriately made of an old-looking parchment style, fitting in well with the overall rustic theme. The cards themselves have a mono-colour back design in a brown colour, featuring two bucks. 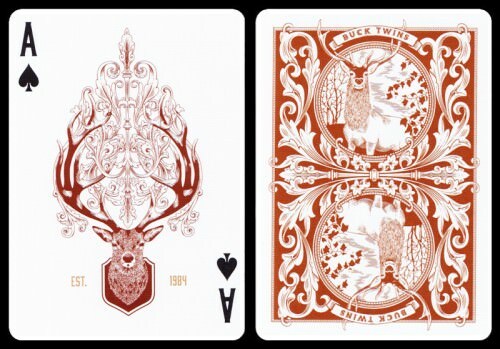 This of course is a clever homage to the Buck twins, Dan and Dave Buck, to whom we are indebted for these beautiful playing cards. Wonderful artwork on the card shows and mimics the forest of the Yosemite National Park. The single colour back design keeps it from becoming to distracting for games or magic, yet ensures that there is elegance in the design. The Ace of Spades features a noble Buck head with artful flourishes ornamenting its antlers, reprising aspects of the back design, and symbolising the Yosemite National Park. The faces maintain all the expected traditional elements in a deck of playing cards, making it very usable and practical. Beside the standard features and look, the court cards are mainly composed of brown shades, which looks great for this deck. The indices also employ a blockier font, which adds to the rustic feel. 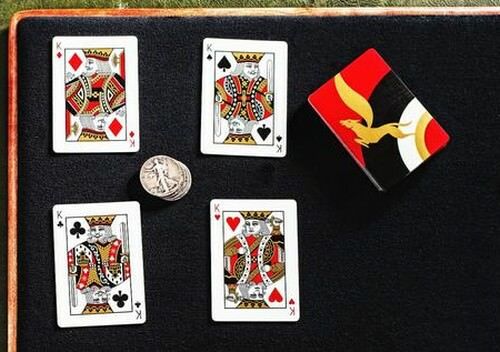 The hearts and diamonds have been depicted using a red that is more brown than usual, in keeping with the character of the deck. 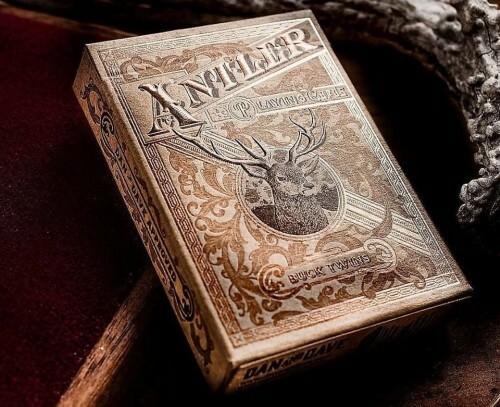 The Jokers feature the name of the deck, "Antler Playing Cards" in fancy writing, and confirm that it is "Dan and Dave approved". The deck does also come with two extra cards, a double backer for magic performances, plus a card with a quote from John Muir. 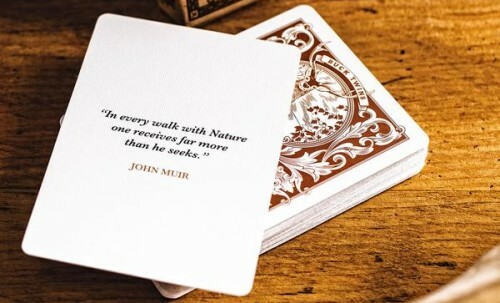 Muir is sometimes known as "John of the Mountains" and "Father of the National Parks", and is quoted as follows: "In every walk with Nature one receives far more than he seeks." This really fits into the idea of the outdoors of this deck, and its sense of adventure. 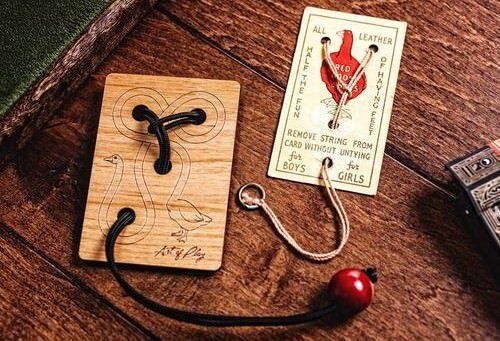 The cards have been printed by USPCC and are on Dan and Dave's trademark crushed stock, which you will find handles amazingly well, being softer than standard and still long lasting. The decks in this category can certainly be used for card games or card magic if you wanted, because the suits and pips are still clearly recognizable. But the degree of customization in these decks is a little more radical. While that might make them somewhat less than desirable for normal usage, it's exactly this quality that will make them very appealing and attractive to the collector. 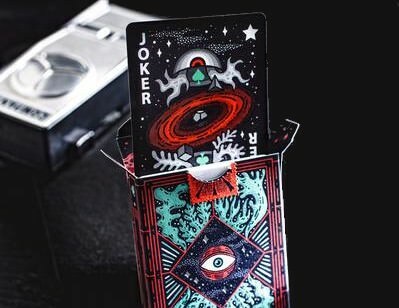 These are decks of playing cards that are very creative, and each has a truly unique personality that will quickly become apparent once we start looking at the cards. The Into the Weird deck of cards is very different from your average deck. 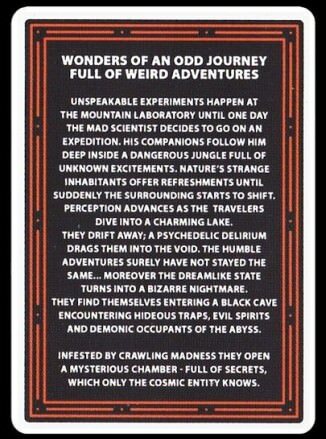 It's truly a weird and wonderful deck of cards, and enables you to discover a story within as you look at it. It’s not easy to describe what this deck is like, since everything about it is truly out of the ordinary, but the tuck case immediately gives a taste of what the deck is like. The front of the tuck depicts an unusual cave entrance with the words "Into the Weird" in the centre. White wisps near the top emphasize a sense of mystery, and the entire image conveys the impression that as you open the deck, you are entering into a weird and strange world. 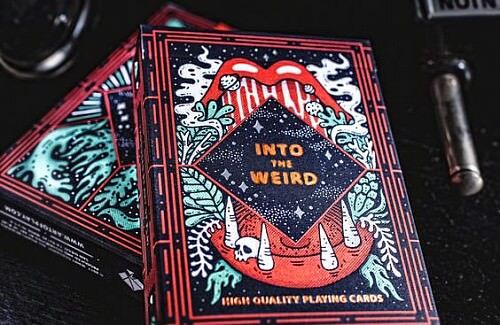 The choice of unusual red and green colours on a black backdrop also emphasize a first impression of something strange and ghostly, and this impression is only going to be confirmed once we start looking at the cards themselves. 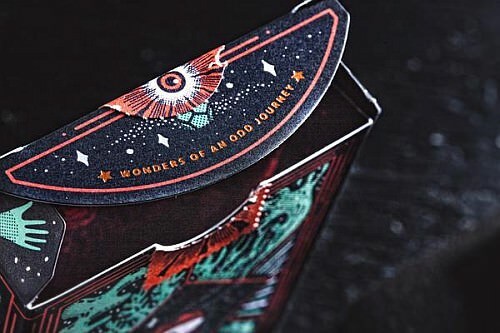 With this new piece of information in mind, we return to the tuck case, and notice that on the inside of the tuck flap there are the words “Wonders of an Odd Journey”, which capture exactly what this deck is about. The back of the tuck case features the back design of the cards, which we will see shortly. 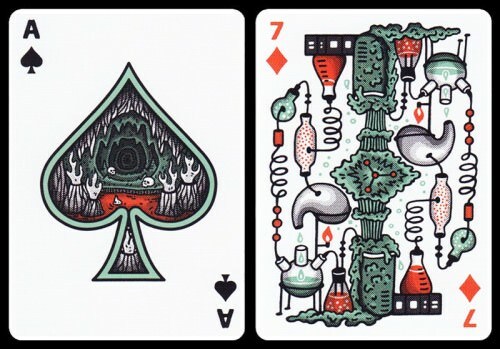 The back design of the deck uses the same strange and mysterious colours as the tuck case, with a ghostly green and unusual red being prominent. It also features a large eye in the centre of a starry diamond, with green plant-like ripples coming off of it. Everything about this design confirms our initial impressions: we are really entering the realm of the strange and unusual. The faces of these cards all have individual unique artworks on every single card, and you can see all of them directly from where the artist has posted them here (although note that the designs have been slightly changed to make them more practical on playing cards). Each suit even has its own "theme", with the Diamonds being air/science, Clubs being earth/nature, Hearts being water/dream, and Spades being fire/nightmare. While there are unique eye-catching artworks on every card, a real strength of this deck is that the indices are nonetheless clear and distinct. This ensures that Into The Weird remains a very usable deck, still you can even play games with the cards while appreciating their designs. The courts also have a very unique feature of being slightly different when flipped upside down, and this quality gives added details to explore and enjoy. 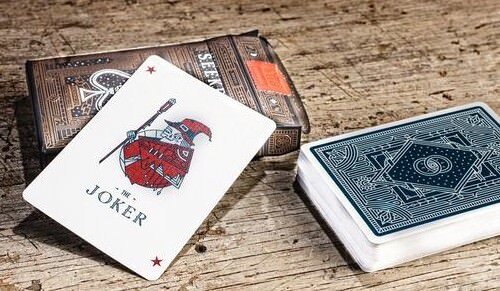 The deck also comes with two jokers, an ad card, and an information card about the deck. The Jokers picture an intriguing eye type figure that has been divided in two and is floating in space. 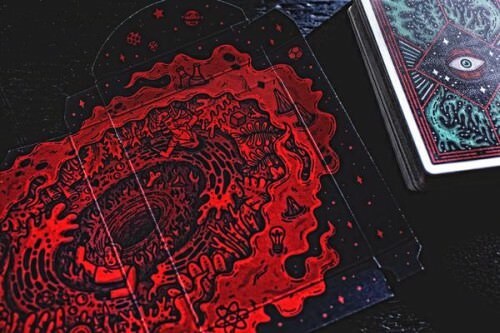 More surprises await discovery by the curious, including full interior printing on the inside of the tuck case, which has been printed with red on black, showing an image of a black hole sucking things into it. The cards have been printed by USPCC on a thinly crushed stock, and they handle amazingly, being soft and still long lasting. The back design is actually quite nice for cardistry, being unique and detailed while also have a few key focus points. Since the indices are very clear, the deck can also be used for card games, while the unique design ensures there's additional interest that goes beyond mere functionality. While not for everyone, this is certainly an intriguing and interesting deck that stretches us far beyond the ordinary! The unique Seekers deck tells a special story of two parallel worlds, and the ongoing struggle for victory. This deck is comprised of very attractive and yet functional cards that have been well illustrated by a talented graphic designer, Billy French, in collaboration with Art of Play. 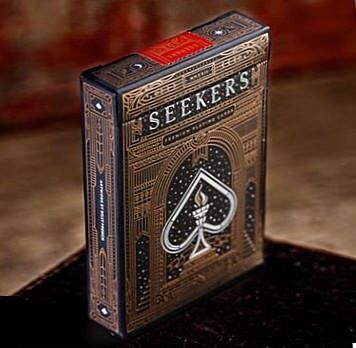 This tuck case is made from a very dark navy blue, and the front shows the name of the deck, "Seekers" and the Ace of Spades in an archway with a starry background. The torch represents an ongoing struggle for victory before our light is extinguished. The back of the tuck features the back design of the cards, which we will look at later. The entire box has lines of design adding classiness to the deck. The interior of the box has been printed with a gold metallic ink, and has been designed to create the impression of a starry night of darkness inside the box. This really adds an extra touch of quality and style to the deck, and evokes a true sense of elegance and sophistication. The cards themselves have a single blue coloured back design, with an economy of design that ensures that it is not too distracting for users of the deck, while at the same time not detracting from class and style. In the centre of the card backs is a large diamond with a starry night sky, and two entwined rings with the Eye of Providence in the centre, representing the fact that there is a God watching over everything. The customized Ace of Spades is a spade with a torch and a starry background, as on the front of the tuck case. 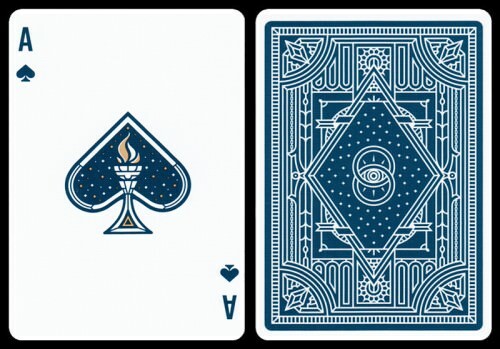 A unique feature about these cards is that the Clubs and Spades employ a blue that matches the colour used on the card backs, rather than the standard black. While this is unusual, this doesn’t make the cards less usable, but instead makes them so much more interesting and special, and also ensures a thematic unity with the card backs. The indices of this deck are very clear, again allowing the cards to be very practical and functional. The pips are all exquisitely customised, thereby contributing to a sense of something original and stylish. 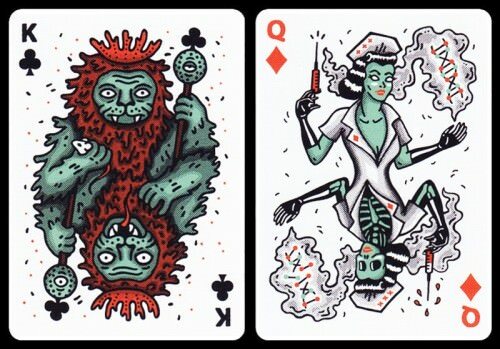 The court cards of the Hearts and Diamonds depict undead characters, which are juxtaposed against the living characters on the Clubs and Spades. The courts are all customised and look very nice, yet are still clearly identifiable and thus usable. Included in the deck are also two Jokers, namely a living blue wizard and an undead red wizard, which fits well with the rest of the theme of the deck. Also included are two ad cards, one for Art of Play, and the other for Billy French, the illustrator. 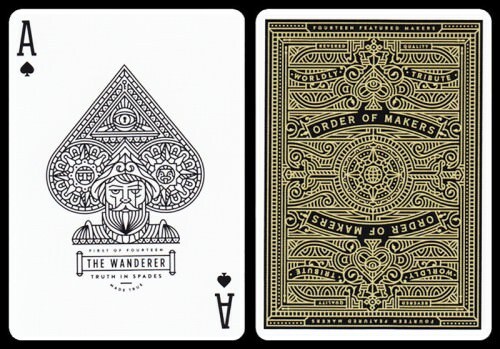 The seal is particularly nice, with metallic gold ink and a key-hole, which you must "unlock" to enter into this deck. Indeed, from the moment we have entered the tuck box and explored the cards within, we cannot help but be impressed with the creativity and quality. These cards have been printed on a crushed stock by the USPCC, and handle amazingly, like all Art of Play’s decks. The crushed stock means the cards are softer than usual and are ready to use right out of the box, whether for games, magic or card flourishing, all of which this deck is great for. 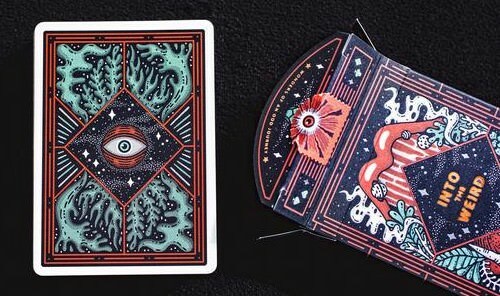 The artwork is amazing and well-thought out, well worth looking at and enjoying, making this deck ideal for the collector, or the magician or cardist. Card flourishing is the speciality of Dan and Dave Buck, and cardists look for a very different set of characteristics in a deck of playing cards, notably the aesthetic appeal of cards in motion. As such, the cards need not necessarily be very functional for playing games or card magic - although often they can serve a dual purpose of being used for these purposes as well. But of primary importance in card flourishing is the visual appeal, and having a design and pattern that looks great when the cards are being handled. And where better to turn than to the legendary card flourisher Cardini, who the Peau Doux deck pays homage to. The name Richard Valentine Pitchford may not be familiar to most people, but perhaps his stage name Cardini might ring a bell. 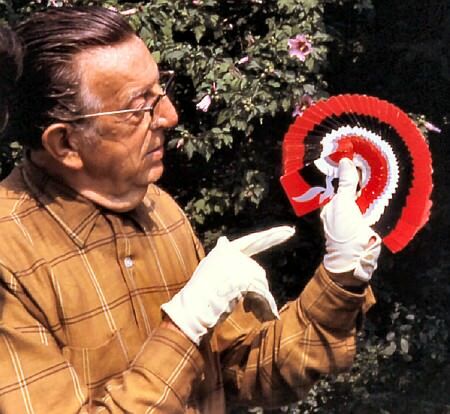 Cardini was an amazing magician whose sense of humour and skill in manipulations and magic earned him the well-deserved praise and respect from audiences and magicians alike. 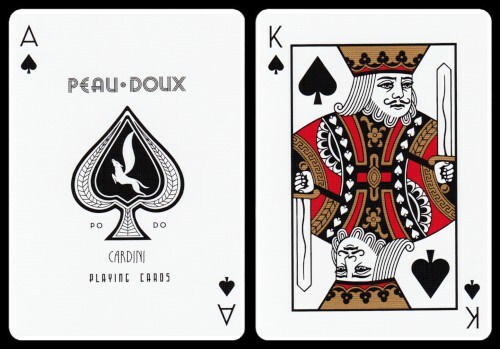 In collaboration with Potter & Potter and Pitchford Entertainment, Art of Play has recently produced a beautiful deck to commemorate Cardini’s life and career, and that's the Peau Doux deck featured here. 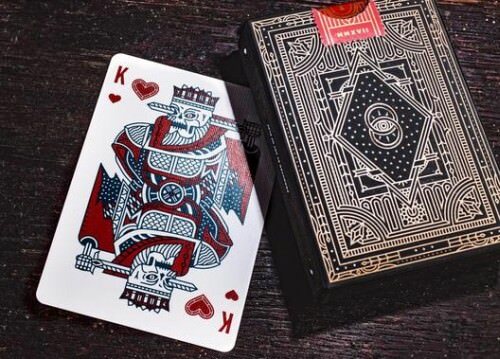 This deck is a poker sized replica of an original deck of bridge sized playing cards that Cardini himself used in performance at his legendary nightclub act, "The Suave Deceiver". You can view one of the few recorded performances of Cardini here (link), which was filmed in 1957. I highly recommend watching the video clip, because you'll appreciate why his act was one of the most well-regarded magic acts of the time! Cardini found this particular deck at a Walgreens Drug Store. He loved the design for fanning and manipulations (which he excelled at) so much that he is thought to have purchased the Walgreens entire stock of cards. He also received assurance from the company that they would not print the design again. He even purchased and smashed the printing plates used to make the deck, to ensure that he alone had the rights to this deck. 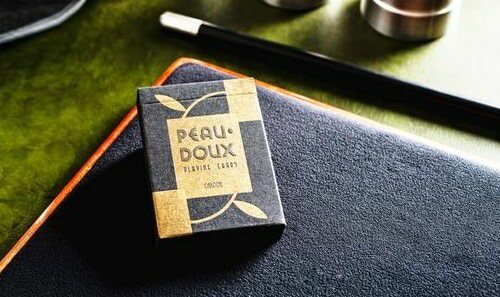 The tuck case largely replicates the original, featuring black with gold rectangles and the name of the deck in a beautiful letter-pressed font on the front. 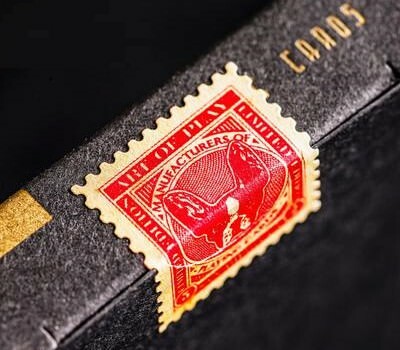 The seal is based on a vintage tax stamp that was used on older decks of cards. It also incorporates the likeness of Mrs Walgreen's pet dog Podo, whose face also appeared on the Ace of Spades of the original deck. 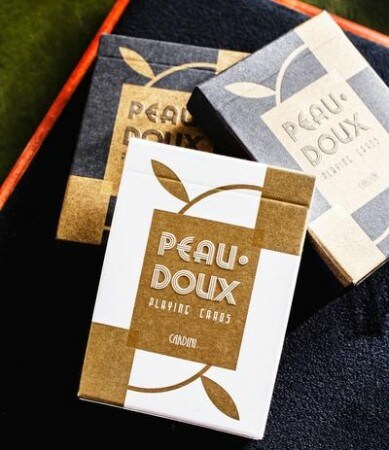 Podo's name is also the obvious inspiration for the name of the deck Peau Doux. The back design of the cards is a striking one-way design with vibrant colours. Set against a red background is a circular pattern in layers of black, white, gold and red, with a golden Pegasus emerging from the gold. Metallic ink is used for the gold colour, adding to the visual appeal, and making this design all the more amazing to enjoy and play around with. This design creates beautiful patterns in fans, spreads and other manipulations, and this is exactly the reason why Cardini loved these cards so much. The Ace of Spades is based closely on the original, but instead of featuring the dog Podo it reprises the Pegasus already seen on the back design. Cardini's name is also mentioned on the bottom of the Ace of Spades as a special tribute to him. 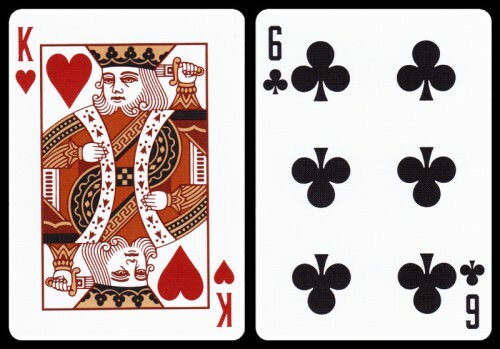 The court cards have a standard design, but limited to the same colour palette of red, black, gold, and white from the card backs. The use of metallic gold ink creates a thoroughly classy look, while ensuring that the court cards are also very recognisable. The faces of the other cards are mostly standard, although the indices and pips are just smaller and more petite than a standard deck. Also included is an extra card with information about Cardini, which is very nice to have with the deck. 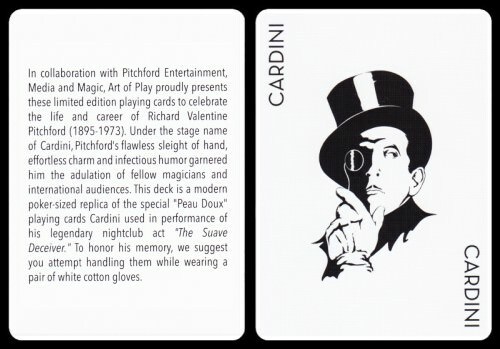 The two identical Jokers also show a silhouette of Cardini himself, since he is the person that this deck was intended to honour. This deck was produced in a limited edition of 2,500 decks, and sold out within a very short time on Art of Play. An exclusive "White Glove" edition was also released. This ultra limited edition has a white tuck box, and was only available to those who purchased 12 or more decks from Art of Play. The name of this edition (White Glove) also pays tribute to the fact that Cardini often performed wearing gloves, which in fact made card manipulations even harder. This would be a feat too difficult for most, but the reason he was able to master performing with gloves was due to the fact that he would practice his manipulations in the trenches during WWI wearing gloves because it was otherwise too cold. The photo below (source) is from 1968, and shows Cardini himself using one of the original Peau Doux decks, and wearing gloves. Printed by the USPCC on Art of Play’s usual crushed stock, these cards handle amazingly and are great to fan and spread with their amazing design. They are great for magicians and collectors who may have an interest in Cardini and can appreciate the fascinating history behind this deck. This is a beautiful deck that functions both as a stunning cardistry deck, but also as a historical curiosity. Having this deck in your hands makes one feel that you're handling a piece of history from one of the most amazing magicians of all time. - Puzzles: Clever conundrums with brilliant solutions cloaked in elegance. - Amusements: Stimulating diversions to inspire creativity, curiosity, and joy. - Games: Luxurious versions of classic tabletop contests and bar-room recreations. 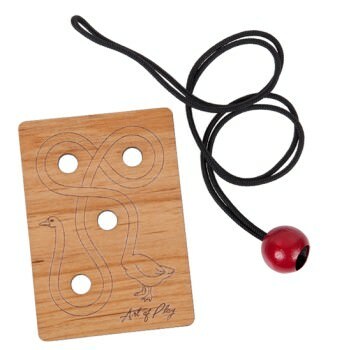 The Red Goose Puzzle is a clever disentanglement puzzle, where the aim is to help the goose escape the noose. This puzzle is quite a classic, and has been around for a while, but this is one of the nicest productions of it you'll find anywhere, with attractive laser-cut wood and a quality cord. 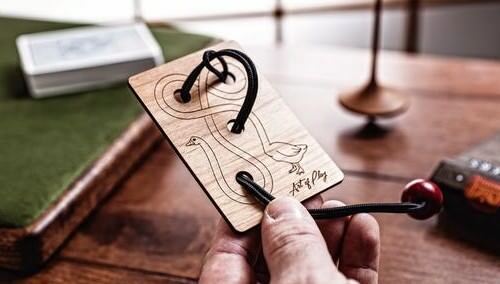 The puzzle is made up of a rectangular shaped alder wood, which has been laser engraved to depict a goose with a twisted and knotted neck. Four holes have been strategically placed in the wood, and through these holes is a black nylon cord, twisted through the holes and around itself. Attached to the end of the cord is a red wooden bead, which is larger than the size of the holes. The aim? Get the cord off the wood and help free the goose! To do this, you'll have to employ some lateral thinking, combined with some trial-and-error. When you pull parts of the cord through the holes, you can start pushing other things through or around - but that's for you to figure out! How difficult is it? Fortunately it's not too impossible. It does require some thinking and fiddling to be able to solve, although some are able to solve it fairly quickly, while others will get frustrated that it proved harder than they thought. It really is a neat little puzzle that has just the right amount of complexity, and most people should be able to solve it within 10-15 minutes or so. This is a great little puzzle that is small enough to easily fit in your pocket, so you can take it with you and challenge your friends and family to solve it. Alternatively, you can leave it sitting on your coffee table as a curiosity or conversation piece, and for visitors to try. Considering that it sells at a reasonable price, the Red Goose Puzzle is a very attractive and well-made puzzle that looks elegant and nice, offering a good challenge without being too difficult, and is a great and unique gift idea as well. Art of Play also has a wide range of other high quality puzzles as well, which should especially appeal to people who enjoy games and brainteasers. 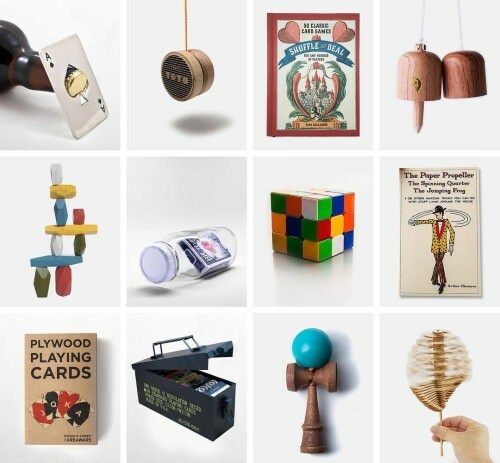 You can browse their site to see the large selection that they have on offer - here's a composite image showing just a few of the curiosities that they have available. 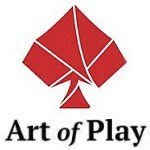 So are decks from Art of Play something for you? 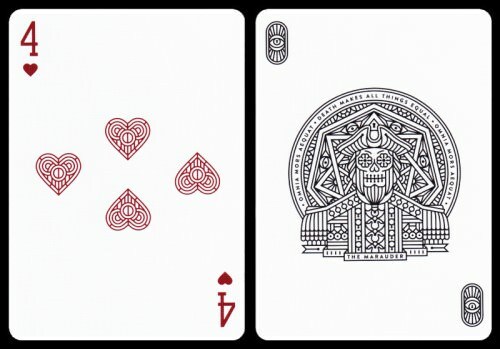 I've sourced playing cards from Art of Play previously, and continue to be very impressed with the custom cards that they produce, along with their other products. With their background in cardistry and magic, Dan and Dave Buck know exactly what good playing cards are about, and they demand exacting standards of quality that ensures that they make and sell only the very best. 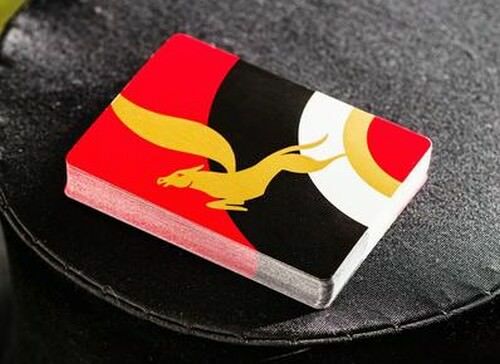 They understand what kinds of patterns, colours, and aesthetic designs are appealing and functional, and they also have good connections in the playing card industry to ensure that the cards they produce are of the highest quality, prove durable, and handle smoothly. As such, those with an interest in card magic or card flourishing are sure to appreciate the custom playing cards that they have contributed to the market. But there's also a lot of other fantastic material over at Art of PLay for those who enjoy card games like poker or other traditional card games. Some of their decks are creative, or opt for a more classy and sophisticated look, while they still look familiar and recognizable enough to be very usable and practical. With fresh designs, as well as carefully placed details on the tuck boxes like foil accents and embossing, these are exquisite and high class products that are certain to please the discerning buyer. Whether your interest is in card magic, card flourishing, or card games, or even just card collecting, you're almost certain to find some treasures in Art of Play's growing collection. For anyone who enjoys quality playing cards, puzzles, or games, this is definitely a site I recommend you check out! Thanks for the very thorough and detailed review. Some amazingly beautiful card designs in there!